Born on 23 April 1894 in Ogdensburg, New York – son of the late Peter Ernest and Christine McPherson Walker – nephew of Jennie McPherson, Glenroy, Ontario – at the time of his enlistment in 1917: present address in Glenroy, Ontario; trade as foreman on railroad construction; single; no current military service; previously served with the 59th Regiment home guard (Kingston, ten weeks); Roman Catholic; height of 5 feet 8.5 inches; chest of 39.5 inches fully expanded; weight of 174 pounds; sandy complexion; blue eyes; brown hair. 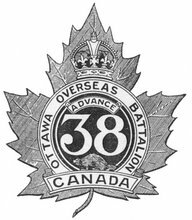 Joined the 240th Battalion, CEF, in Renfrew, Ontario, on 11 January 1917 (number 1042725) – taken on the strength of the 38th Battalion, CEF, on 18 or 19 January 1918 – declared missing, presumed dead, on 10 August 1918 – remains unaccounted for; name inscribed on the Vimy Memorial, France. (Updated with a photo of Pte Walker's inscription on the Vimy Memorial that I took in August 2012).